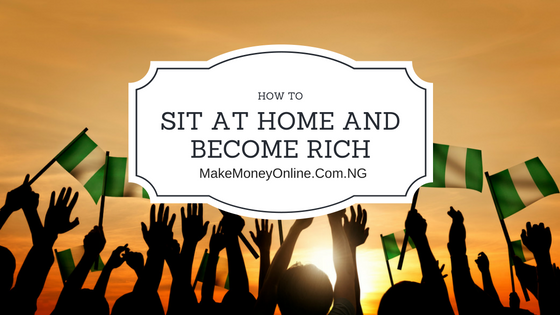 See how you can make much money online by simple referring a friend to buy some products or services. It might interest you to know that I make more money by simply referring a friend to buy what they already need. I enjoy it a lot. Why? So, I make money while being happy! I just want to help others. I love helping others while I make my money. If you found something you like or have used before, you will be happy to recommend that thing to your friend to use too. This act is purely natural to human beings. Now, your friend uses the product that you recommended, he or she is happy. Then I am happy too because they are happy too! This is fun. I mean funny lol. I know you do this a lot. You recommend things even without even knowing that you have. … and you always feel that sense of satisfaction whenever you do that. Am I wrong? You gain the joy of recommending a good product … and your friend earns to the satisfaction using the product you recommended. He or she may even say thank you. … But you are are missing something in-between. You need it to put life together. I didn’t know that money is sweet until I have it. I could easily buy anything whenever I need it. When you have money, you don’t eat to live (quantity food), rather to live to eat (quality food). LOl! That’s what I mean… You can still make some good money from a simple recommendation. All you need to do is to be conscious about when you … Recommend! See.. 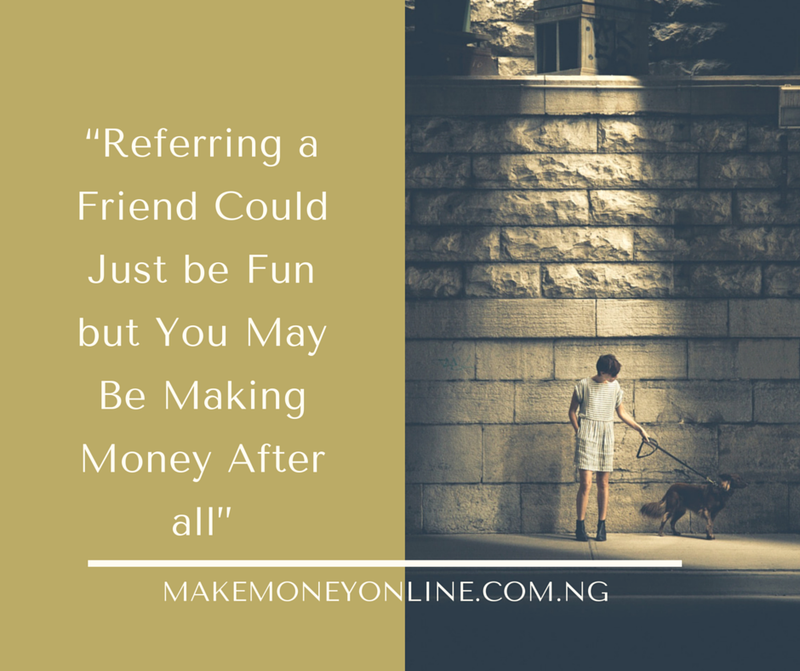 When you make money by recommendation of any product or services to a friend, that friend don’t loose anything. They may not even know that you have made some money from the purchase of the recommended products or services. You are not cheating on him… instead, he’s happy for you because the product or service you recommended is useful to hi, or her. Can you catch the picture? That’s the method many people make money. They make even more money by recommending products or services on the internet. Imagine… they gave it a sweeter name called “Affiliate Marketing”. 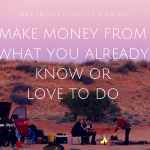 You can either make money by recommending a product or services or you make money from affiliate marketing. All are the same. … and on top of that, you are happy! 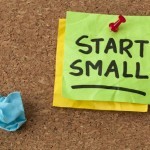 I know you are asking now.. how can I start affiliate marketing? I thought this online business model in one of my business seminar. Guess what? 7 out of 60 people make money online from the model after just one week after the seminar. I will soon publish that report in the case study section of this blog. This could be daily essentials such as food, medicine, cloths etc. You will pick a topic from here. This will become the topic of your blog called . A typical example is ” herbal remedies for malaria”. From this topic, you will agree with me 95 out of 100 people in Nigeria have malaria and will always want to treat it. Another point is that there still reasonable number of people who don’t have faith in drugs instead they resort to herbal solutions to their ailments. You don’t need to be a medical doctor or a herbalist to write on this topic. All you need is to be resourceful. You can even backup your write-up with academic research if you very passionate about it. Sure, the lesser the competition, the chances that you will succeed fast. If you google the topic I suggested ” herbal remedies for malaria”, you will discover that there are not much competition. The research resulted in only about 275,000 results in 0.53 seconds. You can’t compare it with topics like “make money online” which produces about 509,000,000 results in the same time (0.53 seconds). 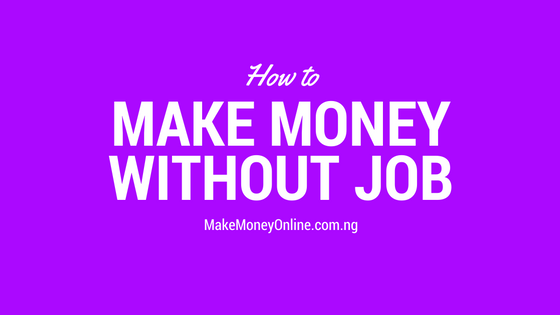 This means that there are over 509 million blog and websites that are already writing on how to make money online. You can compare this competition with ” herbal remedies for malaria” and you will see what I mean. Interestingly, there are many still untapped blogging niches that you can write on and make good money. I mean good money. (b) Google AdSense: You can make serious money from Google AdSense considering the high CPC in health niche. (c) Selling of eBook: If you write very well on this topic, you could become an authority in the niche. With this trust, you can write and sell eBook to your loyal readers and make cool cash from it. (d) Affifliate Marketing: You can put some helpful links to products on other online stores. This is pretty cool business huh! 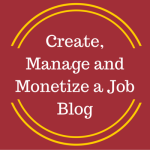 You have to implement your idea by creating a blog on the topic that you what to write on. It’s simple to do that. Then grow your blog to become a sustainable business. That’s what online business is all about. 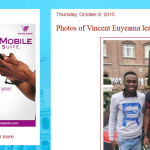 A typical example is this blog you are reading now. 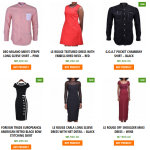 This blog currently makes at least NGN10,000 per day from simply referring friends to buy what they already need. At the end of the day, I am happy and so they are. They are happy too. In fact, everyone is happy and that’s why it’s fun. Pls can i hav a blog on religion n show or recommend a supplement am into which is very gd on same blog? can i also sell or on a different blog. many tanx. Thanks for the replies, Please, What is a custom domain? Is it a domain without the host name? Complement of the day sir Ifiokobong, sir I will like to buy your eBook how much is it and where do i get it sir? I don’t sell eBooks. All my eBooks are for free downloads. I will make them available soon. hi, good morning i am a gambian i’ve been reading your blog and i have found it intresting . what do you think i should do in the gambia to make money online..
Hi Bojang, good to know that you are reading this blog from Gambia. Sure, internet business is not restricted to any location. So, all the lessons you find here is also applicable to your country. Simply find what people need around you and provide the solutions to them in a digital form. Let me know how I can help you specifically for you to get started. Success! well i know this may sound weird but i really dont know anything about blogging, so i think i may need extra help to go about it sir please… i really need this to work on this… is there any way i can contact you privately? 1.Please, how do I sell the ebooks? 2.Is it possible to use google adsense on my free blog? 3. Is Wakanow.com only for travel agencies. You can sell ebooks that you publish on your blo. You can use adsense on your free blog although you will need to have a custom domain on it. WAKANOW is a travel agency business. Yes, I have seen your blo but unfortunately, Google AdSense team may not approve your blog because you have published copied contents on your blog. 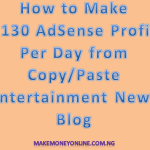 You will need my ebook on how to get Adsense Fast.